Players Recruited By Ohio State: OL Tim Gardner, DB Tyler Green, and DB Jayme Thompson. Gardner was signed as part of Ohio State’s 2013 recruiting class, but left the program after a disciplinary incident in the summer of 2013. Gardner played in eleven games for Indiana in 2015. Tyler Green could technically be considered recruited by Ohio State, yet did not sign with Ohio State in 2015. Green played in eight games as a true freshman for Indiana in 2015. Jayme Thompson was also part of Ohio State’s 2013 recruiting class, like Tim Gardner. Thompson redshirted in 2013, transferred after the 2013 season to Iowa Western C.C. for 2014 and 2015, and signed with Indiana for the 2016 season. Rationale For The Ranking: Truth be told, I struggled with where to place Indiana on this opponent ranking. Think about how the games against Indiana have gone since Ohio State Head Coach Urban Meyer took over the program in 2012 – A nailbiter that went down to the wire in Bloomington in 2012, 52-49. Ohio State rolled Indiana in Ohio Stadium in 2013, 42-14. Ohio State has to rally behind Jalin Marshall’s performance in 2014, 42-27. Ohio State survives Indiana last year in Bloomington, 34-27. Why not rank Indiana higher? Here is why – Nate Sudfeld and Jordan Howard have both departed Indiana for the NFL. While Indiana returns quarterback Zander Diamont, who tormented the Buckeyes last season, I believe Ohio State will have too much on both sides of the ball for Indiana to be able to keep pace as they have in recent seasons. Prediction: Ohio State will be coming off a home game versus Rutgers, and will be tempted to be looking ahead to two tough road trips on the horizon with Wisconsin and Penn State. Even with the road trips looming, Coach Meyer and his staff will be able to remind his players about Ohio State has had extremely tough, close calls against the Hoosiers, and I believe Ohio State will come out with a more focused approach more like the 2013 game than the 2014 or 2015 contests. Today marks 100 days until The Ohio State Buckeyes kick off the 2016 season against Bowling Green. Yet there are still lurking questions about this team that will not be answered in full, perhaps until week five or six. For example, with all of its youth and inexperience, will the 2016 Buckeyes be able to compete on the same level as last year’s team? What will the offense look like in Tim Beck’s second year as Offensive Coordinator? What will the defense look like in Greg Schiano’s first year as defensive coordinator? Has Ohio State been written off, as a serious championship contender, already? If you get the chance to read Coach Meyer’s book “Above the line”, I highly recommend it; not only for the life lessons it provides but for the insight into who Urban Meyer, the man, really is. In the book Meyer talks about his distaste for what he calls “BCD” or blaming, complaining and being defensive. Therefore, it doesn’t come as a shock that, in a time when fans were calling for Coach Tim Beck’s job after last year’s loss to Michigan State, Meyer didn’t blame Beck. Meyer realized that Ohio State’s offensive struggles went deeper than Tim Beck’s abilities as a coordinator; and firing him would not have made this team better. In spite of it all, Beck is back this year; and I fully expect him and Co-Offensive Coordinator Ed Warriner, to have the offense firing on all cylinders this season. A year after one of the biggest quarterback controversies in recent memory, Meyer, Beck and Warriner are completely committed to JT Barrett as this season’s starting QB. The change of pace and the lack of being able to establish a rhythm, that comes with repeatedly substituting the quarterback, were the offense’s biggest issues last year. The solution was never more evident than in the final two games of the season. JT Barrett was the sole starter for the Buckeyes and Coach Warriner moved upstairs to coach from the box. Ohio State’s offense dominated the competition by scoring 42 points against our rivals; and 44 points in the Fiesta Bowl. I simply don’t expect OSU to revert back to its old ways. Finally, with all of the talented that left Ohio State for the NFL, this offseason, the Buckeyes will rely heavily on the play of their on-field OC, JT Barrett. They will also need big contributions from players like Noah Brown, Mike Weber, Brionte Dunn, KJ Hill and Curtis Samuel. All things considered, it looks like this year’s offense is in great hands. 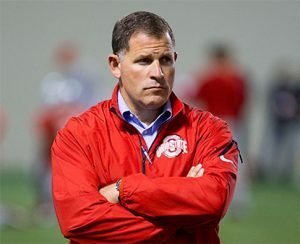 When I think Greg Schiano, I think Miami. I think about Ed Reed and Dan Morgan; Coach Schiano’s two best players during his tenure at “the U.” In his last Defensive Coordinator position, Schiano led the Hurricanes defense to being the number twelve ranked defense in college football in 1999; and the number five ranked defense in 2000. 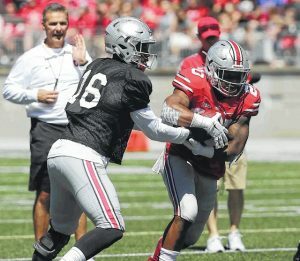 In his first year as OSU’s Defensive Coordinator, Schiano’s secondary is going to look quite similar to how the Bucks have looked the last two years under Chris Ash. However, Schiano likes for his to defense to be “flying around.” In other words, he likes to call a wider variety of blitzes to confuse opposing quarterbacks and offensive lineman, so expect Ohio State’s front seven to spend a lot more time in the backfield. Overall the 2016 Buckeyes are going to start the season as a young team, an inexperienced team, but an extremely talented team. Most of OSU’s twenty-two starters will have never started a game in college, when kickoff comes on September 3rd. Most of these players did not have a major role in the Big Ten championship or the national championship from 2014. Most of these players have not contributed on Saturdays to Meyer’s 50-4 record at Ohio State. Most of them haven’t accomplished anything and they have already been written off by ESPN and others, as incapable. Now its their turn to prove themselves. Though they are young, they are hungry. Their opportunity to leave their mark at Ohio State will begin in 100 days. Players Recruited By Ohio State: DL Darius Hamilton, DB Ronnie James. There may be more players on Rutgers’ roster that had offers from Ohio State, but Hamilton and James are the only ones I could find in my research. Please correct me if I am mistaken. Kickoff Time: 12pm EST. Network television has not yet been announced. Rationale For The Ranking: Ohio State’s homecoming game is against an opponent that has posed little to no threat to Ohio State over the past two seasons. Ohio State defeated Rutgers 56-17 in 2014, and traveled to New Jersey in 2015 and handled the Scarlet Knights 49-7. That averages out to a usual score of 52-12, favoring the Buckeyes. Prediction: Former Ohio State assistant Chris Ash has taken over the Rutgers program, and is doing everything in his power to mold the Buckeyes into a program that will be able to compete within The B1G East’s typical powers in Ohio State, Michigan, Michigan State, and Penn State. Ash will try to mold Rutgers into a tough, physical program, but how quickly can Ash transform the Scarlet Knights, with the talent on hand? Throw in the fact that Ohio State will have a week off prior to this contest, and this one could be another blowout win for the Buckeyes in Ohio Stadium. Earlier this week we heard the news that former Ohio State Buckeye Justin Boren’s company Grass Groomers being broken into. Here is the info from Justin’s Facebook account…. To all my Facebook friends in Central Ohio please be on the lookout for this truck and message me if you see it or have any information on who may own it and/or where they may live. These still images off our security cameras caught this truck pulling in to scope out our property yesterday, Sunday May 15th at around 8pm, and then this same vehicle returned at around 10pm and then again around midnight parked on the side of our building, cut a hole in our fence, and broke into several of our locked enclosed trailers stealing a total of 7 Redmax backpack blowers, 5 Redmax string trimmers, and a pair of Redmax hedge trimmers with a total value of over $5,000. We believe that the truck is a 2002-2006 white Chevrolet 1500 regular cab 2wd pick-up truck. Some of the more interesting features of this vehicle, which should stick out, are that even though it is a white vehicle it has a solid black tailgate, it has some sort of bumper sticker on the right hand side of the rear bumper, looks to have some damage or black scrape marks on the right rear quarter panel, has a Honda generator in the bed (which I assume is probably stolen), and it looks to have some sort of dealer plate on the rear tailgate (which again I think are probably stolen). Any help in catching this thief is greatly appreciated. 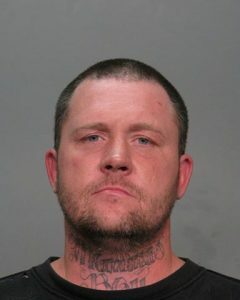 WANTED: 36-year-old Paul Arthurs is wanted for Breaking & Entering. On Sunday, May 15th & Monday, May 16th Arthurs broke into 3 equipment trailers and stole thousands of dollars worth of power tools from a business on Americana Parkway (E Columbus). He was caught on camera committing the crime. 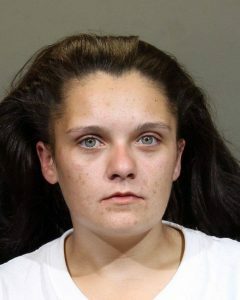 A second suspect, Arthurs girlfriend 23-year-old Kayla Sparks, was arrested this morning and charged with Breaking & Entering in connection to these crimes. She won’t talk, so we need someone who knows Paul Arthurs whereabouts to come forward. His arrest will be his 12th with CPD. Contact Det. Beard in CPD’s Burglary Unit at 645-2077 or bbeard@columbuspolice.org. If you know where Paul Arthurs is please contact the police ASAP and lets help out our fellow Buckeye. Players Recruited By Ohio State: N/A. To the best of my knowledge, there are no players on Bowling Green’s roster that Ohio State actively recruited or offered a scholarship. More on this below, but that is always something to be on alert against, whenever Ohio State plays another Ohio-based opponent. Rationale For The Ranking: Bowling Green is led by first year head coach Mike Jinks. Jinks comes to Bowling Green from Texas Tech, where he served as the associate head coach/running backs coach for Texas Tech. Just as I predict with Tulsa in game two, look for Bowling Green to come into Ohio Stadium, trying to run an uptempo offense, comparable to what Texas Tech or Baylor traditionally do. Prediction: Any time Ohio State plays another Ohio-based opponent, there is always some concern. Remember the scare Toledo put into Ohio State, back in 2011? As written up above, there are players on Bowling Green’s roster that did not receive an Ohio State offer, and that perceived slight, fairly or unfairly, always seems to give that team a slight edge psychologically. Throw in the concerns that the Ohio State players may be taking this game lightly, and that is why I have listed Bowling Green eleventh out of the twelve scheduled opponents Ohio State will face in 2016. Considering the depth and talent Ohio State has all across the board, no matter how inexperienced, as well as what should be a close to sellout crowd in Ohio Stadium for the 2016 season opener, look for Ohio State to come out with a little more intensity and fire than Bowling Green can match. This one will be entertaining for the offensive styles of play from both teams, but Ohio State should be able to have a comfortable lead by halftime. Welcome to Quick Hits, a new feature we are rolling out to highlight the most recent athletes who received offers to play football at Ohio State. Yesterday [May 11] the Buckeyes offered another QB spot to Emory Jones out of Franklin, Georgia. Jones is one of the top dual threat quarterbacks in the nation for 2018, and he’s the fourth quarterback the Buckeyes have offered in the class. Many thought Jones was a done deal to Tennessee, but the Buckeyes are his “dream school,” so the offer certainly changes his recruitment. The Buckeyes want to get him on campus as soon as possible with the hope that a visit will secure a commitment. Jones told 11W he wanted to make a decision by the end of the summer, and it will still likely come down to Tennessee and Ohio State. I personally like what Phil Jurkovec brings to the table, and I’d prefer to have him in the class over Jones, but that’s just me. Derrik Allen of Marietta, Georgia also received an offer yesterday. He’s the 2nd-ranked cornerback in the early 2018 rankings and already holds 23 offers from most of the top schools in the nation. Right now he is crystal-balled to Georgia, but with only two predictions right now, his decision is far from certain. Allen is listed at 6’1” and 185 and judging by his highlights, he plays the ball well while in the air, but he can also play down and make some big hits at the line. A couple of days ago, the Buckeyes offered KJ Henry, a weak-side defensive end out of Clemmons, North Carolina. He’s the 2nd-ranked WDE in the nation in the early 2018 rankings and currently holds 22 offers from pretty much the entire ACC conference, as well as Florida, Tennessee and Florida State. Henry currently has a crystal ball prediction to both North Carolina and Clemson, but Clemson seems to be the leading the chase for now. The Buckeyes are on a roll with 2018 offers, and Josh Belk, the #5 DT prospect in the 2018 rankings, was on the receiving end of one of them. Belk hails from Richburg, South Carolina, and his home state Gamecocks look to be the favorite to land him; however, he also holds offers from traditional powers like Clemson, Florida State and LSU. 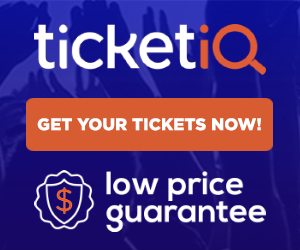 He has three crystal ball predictions in for the Gamecocks, so pulling him out of South Carolina may be a challenge for the Buckeye coaches. GRIND now. Be rewarded later. Coach Mick knows what’s up. The boys are back in the Bus. Ohio State announces its Oct. 1 game against Rutgers in Columbus (homecoming) will kick off at high noon. Tyquan Lewis just missed the top 25 on his list. The Bengals have waived former Buckeye offensive lineman Darryl Baldwin, who had signed with Cincinnati as a free agent this past Feb. 8. Back on the road again! Planting flags in Jacksonville all day today! #bringingthebestinthesouthtothenorth #GoBucks! Raekwon McMillan, Billy Price, Keita Bates-Diop, and Asia Doss are among Ohio State athletes going to Jamaica for Soles4Souls charity work. The countdown until the 2016 NFL Draft was a long winding road filled with suspense and intrigue. There were a few stories that have left a mark and the only one that I can recall is the… Actually, I can’t remember anything right now, but I digress. The 2016 NFL Draft is now over and done with and my job right now is to go over the list of Buckeyes selected in this years draft and honorably mention the ones who weren’t as fortunate, but I trust that they’ll succeed even though their dreams are temporarily on hold for the moment. Thomas was the first Buckeye taken on Day 2 with Pick #47 in the 2nd Round by the New Orleans Saints. After the Saints released Marques Colston, their longtime go-to Wide Receiver, they had to make a move to bolster their receiving corps to complement Willie Snead and company. Thomas has the bloodlines and the sheer potential to add life into the potent Saint Passing onslaught. He can run routes, he can catch it in traffic and he has the ability to separate from opposing Defensive Backs. The only thing that he cannot do is return kicks and punts but his skillset will bolster their offensive attack. Thomas fell into the perfect situation and he has the opportunity to work with a legend in the making in Drew Brees. He will look to him early and often to learn the playbook and to get the timing and chemistry right for the upcoming season. Who Dat!? The Saints strike while the iron was hot during the 2nd Round with the 61st Overall Pick and another Buckeye fell on their laps. This time in the form of Vonn Bell. Bell would provide a talented potential starter for the Saints and he would fit in perfectly with Kenny Vaccaro in the Defensive Backfield. A playmaker to work alongside a thumper is more than Coach Rob Ryan could ask for. Bell will look to patrol all over the field looking to make plays. Rookie Camp will also be interesting since it’ll be like being back at Ohio State. He will defend Mike Thomas for the life of their rookie contracts and it looks to be interesting to say the least. Bell is a steal because prior to the NFL Combine, he had projections for the 1st Round. He will continue to make plays like had always done throughout his Buckeye career and I don’t see any drop off in the NFL. Diesel was picked up by the Buffalo Bills in the 3rd Round with the 80th Overall Pick and Rex Ryan is looking to stockpile Defensive Line depth to get a little younger. After being suspended for the Fiesta Bowl against Notre Dame, he worked his tail off and got himself back on track. Although he had been projected to go in the Late 1st Round to Mid 2nd Round, he finally heard his name in the 3rd and it continued the Buckeyes streak. The biggest asset that Washington has is his quick first step and his ability to beat the initial blocker. He blows past the slower interior lineman early and often and he has the ability to occupy two blocker to free up one of his fellow Silver Bullets so that they can finish the play. Overall good fit for the Bills. X-Brax was taken in the 3rd Round with the 85th Overall Pick to add to a now potent offense. The Texans took Fighting Irish Wideout Will Fuller in the 1st Round. They added Lamar Miller to the fold and now all of a sudden the Offense oozes with potential. Oh, and they still have Hopkins on the roster as well. Although they had released longtime bruiser Arian Foster, I think that they will just fine. The Human Highlight Reel will join newly acquired Quarterback and former Denver Bronco, Brock Osweiler in Houston and I am looking forward to seeing if they can light up the scoreboard early and often this season. Miller will look to prove that the transformation into a new position is complete and that he can be the playmaker that all Buckeye fans know him to be. He will most likely start in the slot and be Osweiler’s security blanket. The Seattle Seahawks took Vannett in the 3rd Round with the 90th Overall Pick and although they still have Jimmy Graham and Luke Willson on the roster another Tight End that is well-rounded cannot hurt what they are trying to accomplish. Yes, the Buckeye Offense rarely used the Tight End, but he was utilized and is a proven blocker. Don’t let the scarcity of his production fool you because he can catch too. He can get open and he can beat slower Linebackers and smaller Defensive Backs if asked to. A workout warrior and a locker room leader, Vannett will learn from Russell Wilson. I am unsure if he’d see the field early but I feel that if he could contribute in any way possible, he would if given the opportunity. Perry was taken in the 4th with the 102nd Overall Pick and he get’s to team up with former Buckeye and now San Diego Charger, Joey Bosa. Bosa also had the privilege of announcing his teams pick. Perry will be a handful for the AFC West. Not only is he quick off the snap, he can diagnose plays quickly and he is not even close to being injury prone. Perry is an athlete. It will be great to see him earn some playing time and watching him grow. With many other Linebackers on the roster, I think that he will become a Special Teams Ace until players either leave or suffer injuries. King Dolo Dale was drafted with the last pick in the 4th Round by the Buffalo Bills. Although Tyrod Taylor is the current Starter at the position, Jones will look to learn and develop while waiting for the opportunity to play. Jones has arm strength for days and I do not see that being the issue. His main issue is locking onto a single receiver and his decision making and touch with his throws. All minor things to work through. Cardale pulled a Hulk Hogan after finding out that he had been drafted and when he finds his true potential, WHAT YOU GONNA DO BROTHER!? It’ll be fun to see him succeed when given the shot to. Although you can debate on whether certain players should’ve stayed an extra year to develop, you really cannot fault them for chasing their dreams and betting on theirselves. Being Undrafted isn’t necessarily a bad thing because diamonds are usually found in this field. It is heartbreaking to not hear you name called but these players still have a shot to stick on a roster whether it is on a Practice Squad or a 53 man roster. Powell was not drafted but he is a playmaker and a ballhawk. He chose to sign with the Seattle Seahawks joining Nick Vannett. He has a knack for making timely plays and what better environment to learn from that from the L.O.B? The Legion of Boom will assist his progression throughout Training Camp. Although a longshot to make the roster, he can still be placed on the Practice Squad to he can hone and develop into a contributor on the Active Roster. Marshall should’ve stayed to develop into a star, but like I had mentioned, I cannot blame a player for betting on himself and believing in his ability. Marshall signed with the New York Jets and he joins former Buckeye Devin Smith in a new look offense. Smith played a key role in the recruitment of Marshall and together they could wreak havoc on opposing defenses if they can develop. Farris signed on with the Detroit Lions and joined Taylor Decker on the Offensive Line. Not many people know that Farris was originally a Defensive Lineman out of high school but due to the lack of able bodies on the offensive side, he was converted. Farris was the final piece to the Offensive Line puzzle that won all the marbles for the Buckeyes two years ago. An able blocker and strong as an ox, Farris will look to once again work alongside Decker. Well it was fun covering this and I cannot wait to see the talent over the next few years develop and have a chance to break the Miami Hurricanes record of 6 players drafted in the 1st Round. Although some players’ dreams weren’t realized, nothing is ever easy and they will all continue to fight to secure a spot on their respective teams. Oh and before I forget GO BUCKS!